Oliver Contreras/Getty; Greg Baker/Getty; Shayanne Gal/Business InsiderPresident Donald Trump and Chinese President Xi Jinping. JPMorgan has initiated a new base case for the US-China trade war: tariffs on all trade flowing between the two countries. “A full-blown trade war becomes our new base case scenario for 2019,” a note from analysts including Pedro Martins Junior and Rajiv Batra said. This, alongside domestic factors, could push Chinese stocks lower. JPMorgan thinks the Trump administration is likely to proceed with tariffs on all Chinese goods sent to the US by the end of next year, according to an analysis published this week. If the prediction comes true, it could spell trouble for Chinese stock markets. 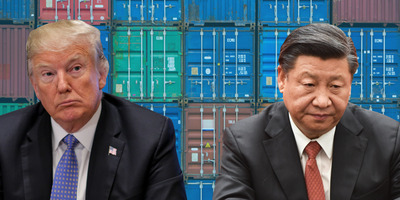 “We now assume US-China trade war enters Phase III in 2019, resulting in tariffs on all +$US500bn of imports from China,” the note, by analysts including Pedro Martins Junior and Rajiv Batra, said. So far, the Trump administration has placed tariffs on $US250 billion worth of Chinese goods, affecting more than 5,000 products. The president has said he is willing to “go to 500” – a colloquial term for placing tariffs on all US imports from China. Observers have started to take that threat seriously after Trump escalated the dispute with his latest levies, which the US applied to $US200 billion of Chinese goods. JPMorgan now has tariffs on all trade between the two countries as its “base case” – meaning the bank believes it to be the most likely outcome. As a result, JPMorgan downgraded its outlook for Chinese stocks to neutral from overweight. The bank thinks the trade war will have a negative impact on China’s economy and, as a result, hit stocks. Assuming both the US and China place tariffs of 25% on all imports, the hit to earnings of companies included on the MSCI China Index would be 2.6 percentage points, with growth slowing to 12.3% from 15%. “China sectors such as energy, IT and industrials will be most impacted based on our analysis, while sectors such as real estate, insurance, diversified financials, telecom and utilities generate virtually no revenue from the U.S,” the team wrote. JPMorgan said that while the trade war was its biggest factor in downgrading Chinese stocks from overweight to neutral, it was not the sole reason. The lender also listed a “higher equity risk premium due to risk aversion and increasing government activism,” further Chinese yuan depreciation, and “uncertainty in China’s reform agenda” as possible drivers of negativity in the Chinese stock market. JPMorgan is reducing its end-of-year target for the MSCI China in 2018 to 85 from 95 and reducing exposure to financials to mitigate any risks.